OUTLOOK: The storm has seemingly passed for Eddie Jones following the toughest period of his tenure as England rugby coach. His team had a positive set of results in November — only a late disallowed try against New Zealand denied the English a sweep of victories — and he has the best bill of health in terms of injuries than he can remember. It means the cockiness and cheekiness has returned to the chirpy Australian, with Jones happy to throw some "grenades" to the media before the opening game against Ireland. That match will likely decide if England can win the tournament for the third time in four years. The team will attempt to overpower the Irish in Dublin. If they pass that test — and it is a big "if" against the world's most in-form team — England still has a trip to Cardiff to come in Round Three, with France's visit to Twickenham sandwiched between them. It couldn't be a much tougher start. The return to fitness of the Vunipola brothers and Chris Robshaw is crucial, while Jones will hope bulldozing center Manu Tuilagi can stay healthy to cause havoc out wide. 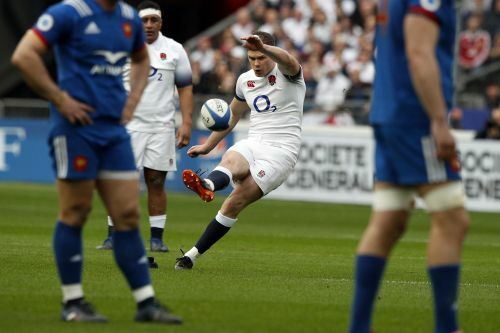 EYES ON: Owen Farrell. He's the captain, the goalkicker, the one true world-class player in the back division. Farrell is a player the English simply cannot do without if they are going to wrest the title back off Ireland. The prime example came in England's test against Japan in November. England was 15-10 behind at halftime and in something of a mess, yet Farrell's introduction sparked a turnaround in a 35-15 win. He also escaped sanction for two shoulder tackles in November. He surely won't get away with it a third time. With Dylan Hartley injured, Farrell has gone from co-captain to sole leader of the team. Jones just has to hope Farrell is ready for the crucial opener in Dublin. Farrell has just had an operation to clean a thumb tendon, and will miss much of the build-up to the Ireland game. QUOTE: "We have always had good squads but this is probably our strongest squad." Eddie Jones. OUTLOOK: It once again looks bleak for France, which has not won the Six Nations since 2010. France won it in style that year, averaging 27 points per game on the way to a Grand Slam and reached the Rugby World Cup final the following year. But living in the past won't help this side. Confidence hit a new low in November when the French lost for the first time to Fiji, and at home. It prompted burly center Mathieu Bastareaud to describe his own team as "little boys." France captain Guilhem Guirado has long complained about France's chronic lack of discipline and an inability to cope under pressure, evident the past couple of years in the way France lost games at the end. Brunel seems to have made his mind up to use this tournament as a steppingstone for the World Cup, saying only 75 percent of the team is in place. He has five players with no international experience, so young players are coming through. But so were they last year when Brunel called up 10 players under the age of 23. It turned out to be a miserable 2018, punctuated by a 3-0 reverse in tests in New Zealand and infuriating last-gasp home defeats to Ireland and South Africa. Something has to change, but whether it will under Brunel is doubtful. Instead, France may have to look for outside help and hire a foreign coach with a more ruthless perspective to get French rugby going again by using its talent base in a more constructive and objective way. EYES ON: Romain Ntamack. The name will sound familiar to rugby fans, particularly to long-suffering followers of the French side who dream about the old days when French flair was envied and respected. The 19-year-old center is the son of former France winger Emile Ntamack, one of the finest wingers France has produced and a player capable of spectacular tries from distance. His son plays differently, but has already shown for club side Toulouse that he has remarkable composure and maturity for his age. He can take a tackle and, for good measure, he's a decent kicker. Brunel could pair him alongside Bastareaud or Wesley Fofana, who is playing in his final Six Nations. QUOTE: "I don't have a miracle cure. I'm aware of our weaknesses but I believe in our strengths." Jacques Brunel. OUTLOOK: Super. Ireland is the world's best team right now, despite the rankings. But it's one thing to reach the summit, and another to stay there, as New Zealand coach Steve Hansen warned the Irish two months ago. A year ago, an England side bidding for a hat trick carried a super-sized target on its back and crumbled. Ireland will be the target this time, and how it copes with that will determine where the trophy ends up. Can it maintain the focus and drive after its greatest year? There's no doubt Ireland is good enough to retain the championship, even with only two home games. By finishing in Cardiff, where Wales wait eagerly, Ireland might even have to win the title on points difference. But great teams thrive on making history, and in 90 years only two have achieved consecutive Grand Slams: England in 1991-92, and France in 1997-98. Ireland has a great shot at joining them, thanks to one who knows how to carry a target more than most, Jonathan Sexton. The irreplaceable flyhalf will receive another great platform to dictate proceedings from the likes of Tadhg Furlong, James Ryan, Peter O'Mahony, and a fit-again Conor Murray. EYES ON: James Ryan. In a team full of names, Ryan is fast becoming one. After leading Ireland to its first Junior World Cup final in 2016, Ryan made his senior debut off the bench a year later in mid 2017 against the United States, before debuting for his Leinster club. Thanks to a remarkable engine that produces a phenomenal workload, the lock not only survived at test level but thrived and impressed. By his fifth test he was first choice for Ireland and featured in a Six Nations Grand Slam, Ireland's first series win in Australia in 39 years, and a first home win over New Zealand. The 6-foot-8 (2.03-meter) university student showed his mettle by subduing Brodie Retallick, the world's best lock, and Maro Itoje last year, and he's still 22. In Ryan, Ireland appears to have unearthed the successor to Paul O'Connell. Ryan makes most of his contributions head down around the rucks, where defences are thickest, making double-digit tackles, and double-digit carries. Also, he scrummages behind indispensable tighthead Tadhg Furlong, contributing to the power on that side. "Because he is so special people keep expecting it from him," lock partner Devin Toner says, "but he keeps on stepping up." QUOTE: "A little bit of fear is a good thing, it drives you on." Ireland captain Rory Best. OUTLOOK: Italy has finished last 13 out of 19 times, and there is little to suggest this year will be any different. Since replacing Jacques Brunel, O'Shea has won only six of his 28 games in charge, with none of those victories coming in the Six Nations. Italy has lost its last 17 matches in the tournament, dating to 2015. However, all talk of replacing Italy in the Six Nations was nailed on the head in November when it beat Georgia, the best of Europe's second-tier sides. O'Shea's position was also reaffirmed this week by federation president Alfredo Gavazzi after rumors of change started in the French media. O'Shea took on the job in 2016 not only to coach but also to transform Italian rugby from the ground up, and the results are starting to bear fruit. Treviso missed out by just a point from qualifying for the playoffs in the European Challenge Cup. O'Shea has debuted a ton of new talent, and he says they gave their best performance of sustained commitment in November in a 26-7 loss to Australia, after the Georgia win. That's the standard he's asked his side to meet or surpass in every match of this Six Nations. Do that, he says, and they will be very competitive. Italy has three home matches, but its best chance of ending its record tournament drought is the opener at Murrayfield, against Scotland. The Scots are, by far, the side beaten by the Italians the most often — seven, including two at Murrayfield. EYES ON: Ian McKinley. The Ireland-born flyhalf's remarkable story could reach another milestone if he makes his Six Nations debut, eight years after retiring after losing the sight in one eye. During a club game in 2010, a teammate accidentally stood on McKinley's left eye and perforated the eyeball. He retired the following year after losing sight in the eye. But McKinley returned to playing rugby in 2014 using specially manufactured goggles, and played for Viadana and Zebre before joining Benetton in 2016. Having qualified for Italy on residency grounds, he kicked a late penalty on his international debut to help the Azzurri beat Fiji 19-10 in November 2017. His last test was last November against Ireland. QUOTE: "We can learn a lot from other countries, but a lot of people can learn a heck of a lot from the way this team conducts itself." Conor O'Shea. OUTLOOK: The good news for Scotland is it has three home games. Murrayfield will be frothing for Italy first up, then Ireland second, and Wales later. The bad news is the two away games, in Paris and London where Scotland hasn't won for a long time. The Scots have yet to fix the mental block they have away from home, from being out of their comfort zone, which has prevented them from becoming a great side. Instead, they remain merely a good one, a side that hasn't beaten anyone on the road apart from Italy in nine years, and hasn't won three tournament matches in a row in 23 years. And yet, Scotland has the goods: A strong tight five, and a lethal back three, pivoting on a savvy scrumhalf and flyhalf with some X-factor. But at flux is the back row and midfield. Without John Barclay, who has yet to return from Achilles tendon surgery, and Hamish Watson, who is set to miss at least three matches after breaking his hand, the struggle at the breakdowns will continue. Center Huw Jones is in the squad but hasn't played for Glasgow because of injuries. Glasgow and Edinburgh reached the European Champions Cup quarterfinals together for the first time, which has added to the pressure on Gregor Townsend to harness their confidence and combinations into an even better national team. EYES ON: Greig Laidlaw. He's the scrumhalf, captain, goalkicker, and glue who holds Scotland together. But just a year ago he was an afterthought. He was out for most of 2017 after breaking a leg and tearing ankle ligaments. New coach Townsend made Barclay captain, and Ali Price established himself as the No. 9. But then the 2018 Six Nations started and Scotland was smashed in Cardiff. Laidlaw started the next game against France, contributed 22 points to a win, and finished the match at flyhalf, reminding of his versatility when Finn Russell imploded. After Barclay was injured last season, Laidlaw was restored as captain. More than half of his Scotland caps are as captain. He's a natural, walking the fine line in being able to employ the gameplan and give teammates the confidence to cut loose. His smooth goalkicking also relieves Russell and Stuart Hogg. Laidlaw has captained Edinburgh, Gloucester, and his current club Clermont, which made him its first foreign skipper. That's because he backs himself, and his team. He'll turn 34 at the Rugby World Cup, and Scottish fans will hope he'll celebrate it in Japan. QUOTE: "You see the teams that win championships and Grand Slams, they are consistent and win even when they're not at their best. That has to be the next step for us." Scotland center Huw Jones. OUTLOOK: Wales' players are not planning any farewell presents for coach Warren Gatland ahead of his final Six Nations in charge of the team — "There will be no cakes and candles in our camp," captain Alun Wyn Jones said — but one last championship victory wouldn't be a bad way to say goodbye. Gatland will be leaving his Wales job after 12 years at the helm following the Rugby World Cup in Japan so the Welsh have an added motivation heading into this tournament. Recent results should also raise hope of a first Six Nations title since 2013. They are on a run of nine straight wins, including an unprecedented four from four in November, and two more are needed to tie the record set by the class of 1910. Wales opens with trips to France and Italy before hosting England for what could prove to be an historic match. How fitting it would be if it comes down to a decider — potentially for the Grand Slam — on the final weekend in Cardiff between Ireland and Wales, Gatland's past and present teams. EYES ON: Gareth Anscombe. There's rarely a bigger debate in Welsh rugby than who should wear the country's hallowed No. 10 jersey, and it is currently a three-way fight between Gareth Anscombe, Dan Biggar and Rhys Patchell. Anscombe is the man in possession after starting the wins against Australia and South Africa in November. His running game from flyhalf gives Wales a new dimension, especially alongside speedy scrumhalf Gareth Davies. The experienced Biggar is reliable and clearly a better goalkicker, but would be a more conservative pick. As his team gradually evolves from "Warrenball," Gatland is likely to choose Anscombe for the Six Nations. QUOTE: "Easier to be the hunter than the hunted, especially this year." Alun Wyn Jones. How are the 6Nations teams shaping for the Rugby World Cup?